If you’re looking for an at-home arm workout that targets and tones your shoulders, biceps, and triceps, this workout I found on XHIT Daily is for you! I’ve been doing this arm workout for about 3 weeks now and I’m seeing GREAT results. It’s only 12 minutes in length, so I can easily squeeze it into my evening routine, and I’m totally thrilled I’ve finally found a workout that has taught me how to lose arm fat FAST! The instructor, Rebecca-Louise takes you through 12 different moves specifically targeted to tone arms. Most of these are arm workouts with weights (she uses 3 lb weights in the video). You can buy a weight setof small dumbbells for under $30. A few of the exercises for arms use no weights at all. If you’re starting out, you can also drop the weights at any point in the video and just do the arm moves – I promise you will still feel the burn! The versatility of this workout is perfect for newbies even if you’d prefer to start out without extra weight and move up later. You’ll still target and burn arm fat! The exercises switch around between the different upper-body target areas, doing a few exercises in a row targeting the same area and then moving to a different muscle. This builds lean, toned muscle. For example, the first two exercises are for shoulders and then the instructor moves on to triceps and giving shoulders a four minute recovery break. The switches feel like I’m sneaking in a bit of a break even when I’m still working out! If you’ve looked into how to lose arm fat before, you may have seen some of these exercises, and they’re easy to follow (making them great for beginners too!). One move new to me was “In and Out Curls” which is a type of bicep curl. You take the weights straight up first like a regular curl, then you rotate your arms out to the side and lift up with your arms out at an angle. I was also unfamiliar with the “Havyk Raises,” but after looking them up, I found that experts seem to agree these are a critical part of any arm workout! The instructor, Rebecca-Louise is super motivating. She’s great at giving reminders to tighten up your abs, keep your back straight, keep a slight bend in the knees and to keep breathing – all things that are important for good form! This 12-minute arm workout video allows you to see all the moves very clearly so you can focus your effort and lose arm fat fast. If done correctly and often, I think you’ll see results from this upper body workout. Just in case you don’t have an internet package that allows you to stream workouts for hours each month and/or want something you can take with you when you travel? Order the Jillian Michaels Killer Arms & Back workout video. You won’t regret it! Don’t forget to subscribe to XHIT Daily. They have TONS of fabulous workouts to whip your body back in shape, and their trainers are so upbeat and motivating! In addition to this awesome video on how to lose arm fat, they have great workouts for a flatter stomach, toned thighs, total lower body toning and tons more! 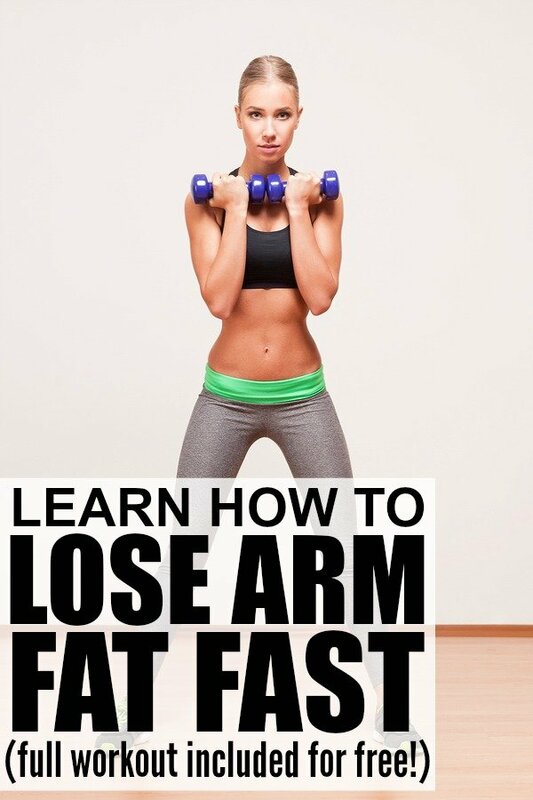 If you found this arm workout to lose arm fat as awesome as I did, please share it on Pinterest! And if you’re looking for more workouts to help you get back in shape this year, please follow our Fitness board where we share all kinds of inspiration!